Imagine that you are a theatrical director and that you are preparing for a professional performance of a play. One of the actors is concerned that he will not be able to create a credible character in this difficult to set play - Advise. Imagine that you are a theatrical director and that you are preparing for a professional performance of a play. One of the actors is concerned that he will not be able to create a credible character in this difficult to set play. Advise the actor as to how you want the role to be approached. 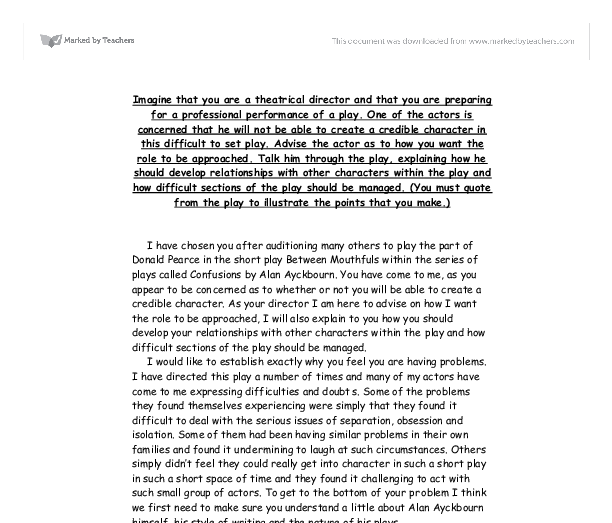 Talk him through the play, explaining how he should develop relationships with other characters within the play and how difficult sections of the play should be managed. (You must quote from the play to illustrate the points that you make.) I have chosen you after auditioning many others to play the part of Donald Pearce in the short play Between Mouthfuls within the series of plays called Confusions by Alan Ayckbourn. You have come to me, as you appear to be concerned as to whether or not you will be able to create a credible character. 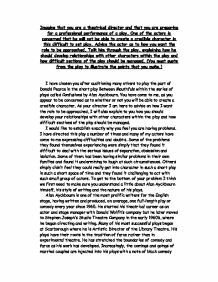 As your director I am here to advise on how I want the role to be approached, I will also explain to you how you should develop your relationships with other characters within the play and how difficult sections of the play should be managed. I would like to establish exactly why you feel you are having problems. I have directed this play a number of times and many of my actors have come to me expressing difficulties and doubts. Some of the problems they found themselves experiencing were simply that they found it difficult to deal with the serious issues of separation, obsession and isolation. Some of them had been having similar problems in their own families and found it undermining to laugh at such circumstances. ...read more. Yes please" and to Mrs Pearce "(fiercely) Could you kindly try and control yourself" It is essential that you make this extremely meaningful. The audience should be left feeling that they know the character of Donald Pearce inside out and that he is not someone they would choose to be friends with. I have talked to you about the beginning of the play and I have talked to you about the end of the play but I haven't really talked much to you about the middle of the play. There is a very amusing conversation between Pearce and his wife where Pearce finds himself having to read out the menu over and over again to Mrs Pearce as she has forgotten her reading glasses: "Mrs Pearce: 'My reading glasses. I've left them at home" and later on: "Mr Pearce: '(fading up) ... Dover sole meuniere. Lobster thermidor. Lobster americaine brackets when in season. Scampi - all sorts of scampi - grilled halibut ... (he fades out).' This could possibly be the section of the play which receives the most laughs from the audience but it is all to do with timing, which I am going to go on to talk about next. Timing is an essential factor in all plays produced at this level but it is particularly important in Between Mouthfuls. The reason for this is because the audience has to follow two conversations at the same time. If you do not pick up where you left off then there is no way the audience is going to be able to follow what is going on. ...read more. For every detail we should be thinking how the audience would see it, how they would react, would it make them laugh and would it make them forget everything else around them and make them fully focussed on the play. The audience should feel involved, they should leave the theatre feeling that they have been involved in something magical, something they will never forget. Due to this fact the actors should really know thoroughly not just their lines but also their character and the background of the play they are performing in. They should be proud of their performance if they feel they have done well and they have really felt that they were their character then it will have seemed this way to the audience. In Alan Ayckbourn's own words: "Always work with something you admire and not with something you only set out to make fun of. That way you might even manage to raise your game rather than lower it." In the end I would say I am your director and I am here to help and advise you in the best way that I can, but at the end of the day I am not the actor and cannot do the job for you. I can tell you the way I would like things to be done but it is up to you to go away and out it into context. I have given you all the aid I think you need and my last point would be to say to you to always remember that although Alan Ayckbourn's plays are produced in the medium of comedy they all deal with society, they all present a gloomy prediction of a possible future world where society, as a result of the behaviour portrayed, has all but collapsed. ...read more. All of this linked to the idea of creating a natural character on stage, in order to step away from the unrealistic style of acting before the late 1880's. Imagination can be used to create places familiar to ourselves, or to create fantasy situations. UA was purely a distrib. for "a small group of elite independent producer." Analysis of the Hollywood Studio System During the 1920s, and 1930s the Hollywood film studios undertook a major evolutionary period. The inception of the Hollywood 'studio system' was to change the film making process radically. the aboriginal scenes is didgeridoo music as this is a native instrument to Australia. The Language Wertenbaker uses shows character, an example of this is Liz's monologue in Act 2 scene 2 where she use lots of slang "born under a ha'penny planet" this shows the audience she is uneducated. Independent measures were used, as skilled and unskilled players are used, therefore needing different participants. These groups chose themselves because participants couldn't be both skilled and unskilled. They were either a skilled player, or not. The independent variable (IV), is the variable which is manipulated. * Another aural contrast in the play is the way the characters speak. Ui's speech develops throughout the play, as it progresses, due to his increase in supremacy within society, and the power he gains. However, the other characters, mainly his 'underlings' speak using extremely simplistic language throughout the play. Being the keybearer of the locked dark secret makes Mother a pivotal character who is omnipotent and fully in control. Mother's refusal to allow Chris to marry Ann is evident when she proclaims -'He's not going to marry her.' This firm and absolute statement shows how adamant she is. He also slapped one of the men's arse and stood on the trunk when the men tried to lift it.